So there may be no reveals of anything classic movie-era related coming out of New York Toyfair this month but its always nice to get something unexpected (and with no agonising waiting time) appear from nowhere. 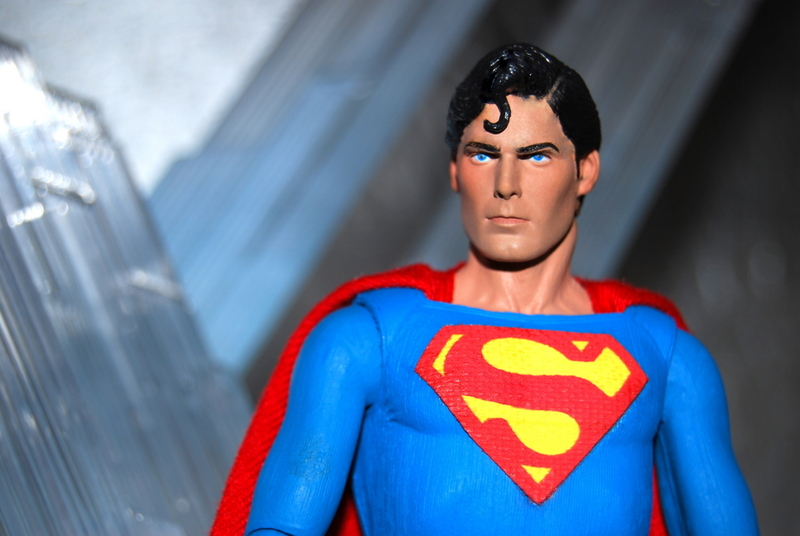 Even having played a similar trick with their extremely popular left-field release of a 7″ tall Keaton Batman ’89 figure, it still seemed unlikely in the extreme that NECA could afford Superman similar treatment – they even said as much on Twitter and besides, didn’t Mattel have the license?? So imagine the surprise when a perfectly formed little cousin of their monster 1/4 scale pops up on the NECA website alongside an equally unanticipated Adam West ’66 Batman. Released in conjunction with WB as a DVD Incentive (apparently the only way they were granted permission to do it) these beauties literally flew off the shelves of TRU’s all over the country and soon became the dream item of your favourite auction site’s opportunist. As for those of us across Europe desperately wanting that hole in their childhood filled too, ‘screw you’ seemed to be the prevailing attitude as this was to be a Stateside promotion only with no worldwide release pending. Luckily for SUPERMANIA, friends and fellow SuperFans would come to the rescue and send a pair over the pond for the collection. In hand, the figure is somewhat of a marvel but, as is common knowledge by now, their QC is abominable. The stories of limbs snapping off like toothpicks are 100% true and the chances of finding one with without a careless paintjob were slimmer than finding one at all. NECA got many things right. 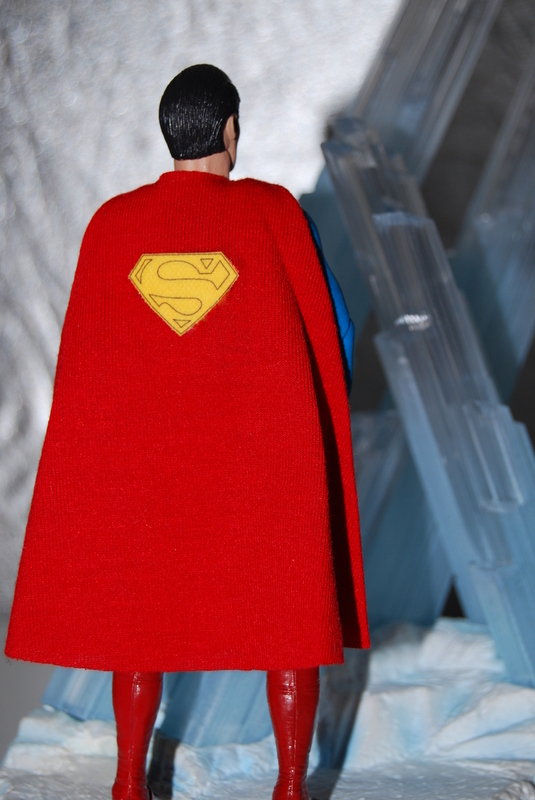 The headsculpt (always a contentious issue) is superb, and the cloth cape mounting is the best on any Superman figure to date. The packaging is a delight (scaling down the 1/4 scale to even better effect) instantly making this the toy you always wanted to open at Christmas. Naturally its not all good news. While the decal for the cape shield is a good effort, the chest logo is just as awful as the Quarter scale (where there was no excuse either) and the focal point for the worst of the paint QC. 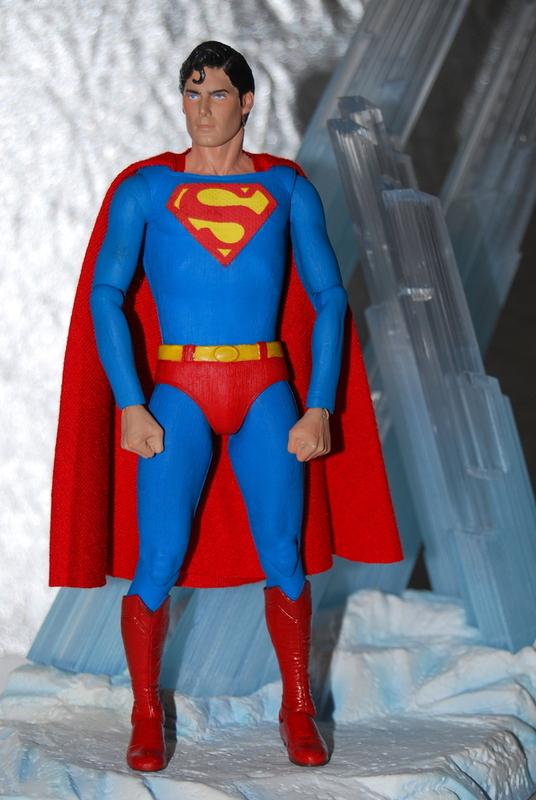 The proportions are also slightly odd, skinny arms, narrow shoulders and short legs compounded by the thinnest belt rendering on a Reeve Superman figure so far (even Mattel got this right). The boots go some way to making up for this but when its posed (providing you didn’t snap both legs clean off) he appears slightly bow legged. 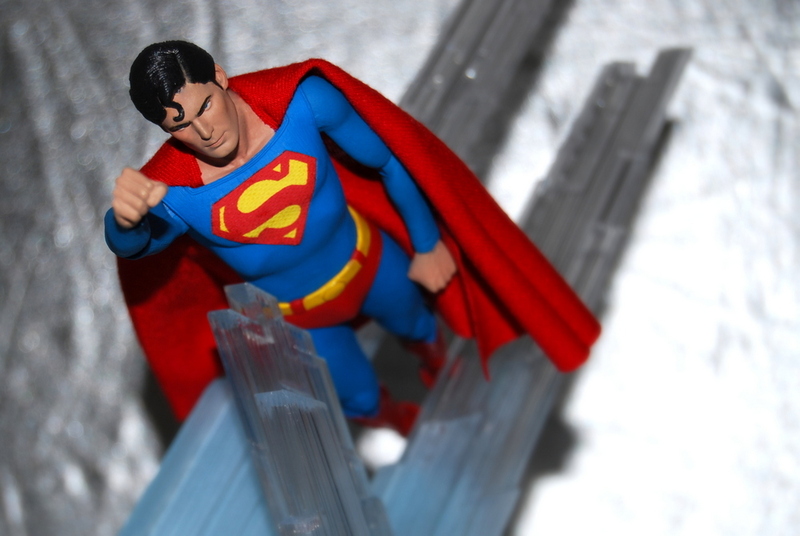 As SUPERMANIA was one of the many infuriated by having the figure broken within seconds releasing it from the package, the decision was made to customise it, the results appearing above. Thankfully this figure needed little in the way of adjustment to make more movie-accurate. Printable fabric patches took care of both under-par shields (first/third pics) a little work with a craft knife added a parting to the hair (repainted to match Reeve’s hairline for the Donner years, second pic). and taking an iron to the cape (careful with this!!) made all the difference. It was finished with gloss coat on the belt and satin on the boots. Posed against the Hot Toys diorama (which the scale is far better suited to) and posed appropriately the result speaks for itself. SUPERMANIA wished to thank James Sawyer (of 1989BATMAN.com and SuperFan Brian Adriaansen for their kind assistance with this post..! !